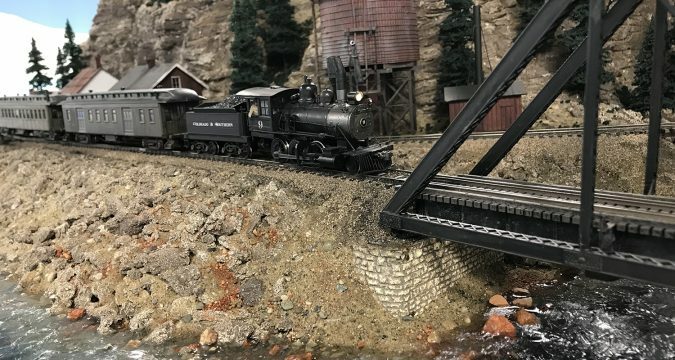 Although this blog is mostly about small layouts, this week I am sharing my experience with operations on Doug Tagsold’s Colorado & Southern layout. Doug’s layout fills about 75% of his basement so this is not a small layout by any means. Doug tries to hold an operating session each month and for the last year has been inviting me to attend the sessions. I have to admit, I was a complete novice when it came to operations on a large layout running multiple trains and using a dispatcher. I had read on it, but it is nothing like doing it for real. Doug and his crew have been very patient with me and I really appreciate that. Doug has been putting a lot of time and effort into his layout and it is really becoming a work of art. I have traveled the area of Colorado he is modeling and have to say, he is getting the scenery right. This week we saw a new prairie scene for the first time and it looked very good. The following videos are from the operating session held August 3, 2017. Locomotive #73 leads train #45 Westbound for Central City. Locomotive #73 continuing up the valley toward Central City. Locomotive #73 now leads train #46 Eastbound across the high trestle after completing work at Central City. #46 is headed back to Denver for the night. #46 heading East back to Denver. #46 passing extra Extra 72 on the siding. Doug, I am really taken with your 1/72nd scale Narrow Gauge Idea. However, you/we need to come up with a better name than 1/72nd to describe it. I had been toying with tearing down my current HO layout and building a Rio Grande Southern Layout in Sn3. However, the thought of tearing out 30 years of hard work and effort and starting over and the high price of Sn3 equipment, scares me off. Your 1/72 idea is very much in my considerations at this time! Thanks! If you pick up a copy of the recently released issue of “Model Railroad Planning 2018” from Kalmbach, you will find an article about my layout. Just as you, I was looking for something similar, but less expensive, than Sn3. Let me know if you come up with a name or letter designation to call this 1:72 scale. I’ve been trying for some time, but had no luck coming up with anything that seemed to make any sense.. Thanks Doug for this effort. Have jumped into this and created a website. Having done other scale/gauge variants, You should call this venture Scale1/72, no need to add a narrow gauge designation because I doubt any with build 1/72 standared gauge.